As usual, a fortune-telling octopus is hogging the camera. For the last week, sports commentators, blogs and even the New York Times have found a new media darling in Paul the Octopus. Paul, an oracle from Germany, successfully predicted eight out of eight World Cup matches, including all of Germany’s games and the eventual championship winner Spain. 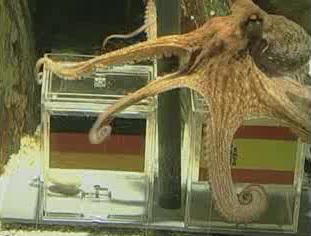 The fortune-telling went as follows: Paul’s handler dropped two sets of mussels into the octopus’ tank, each labeled with the national flags represented in the upcoming game. Then Paul would hungrily dig in. The country whose flag was on the food Paul chose first would be the winner. Spanish fans love Paul the Octopus (then again, Spanish fans love everything right now, because they’ve been drunk for three days). But he became a thorn in the side of losing teams like Germany, Uruguay and the Netherlands. German fans called for his death, requesting he be roasted like witches were a few centuries back. Poor Paul should serve as a healthy reminder, though, that the topic of witchcraft and of witch hunting is still life or death in other parts of the world. In the last few years, a trend has broken out in refugee camps of accusing elderly women and young children of witchcraft. If a disease breaks out, or if many people die closely in time to each other, it is easy to want to blame the suffering on something and someone, and witchcraft has become a popular target. Even though medical workers attest to the causes of death being improper hygiene, lack of clean water, or refusal to go to the health clinic, many people blame the older women who practice alternative medicine in the camps. Accusations of witchcraft – particularly in fundamentalist Islamic communities, can lead to abuse and abandonment, torture, starvation and death. The UNHCR reports that, even though the problematic allegations persist mostly in Africa, they also occur worldwide in placed like Bolivia, Cambodia and Haiti. The fear of witchcraft tends to arise in places of extreme conflict and crises and is often a form of release for the anxieties that naturally come from living in a state of constant terror. Forced Migration Online and other refugee groups are trying to raise awareness for the issue and help educate displaced people in how diseases spread and what preventative measures can be taken. In the meantime, we can enjoy the truly witch-like powers of Paul the Octopus, who is probably much more dangerous than innocent elderly refugees, but who is also much better guarded from his accusers. Paul the Octopus was a welcome respite for many of the World Cup fans around the globe as they struggled to awaken from their comas induced by dozens of 0-0, 1-0, and 2-1 World Cup games. A lifetime of such interest, well, just look around and see for yourself. Today is Bastille day in France. I wonder what Paul would say about that. I wonder if Paul has ever been to Vegas, or if he would like to go.